Experience this empowering massage that incorporates the use of the hand and many different types of large and medium palm size crystals. at that time of the session. 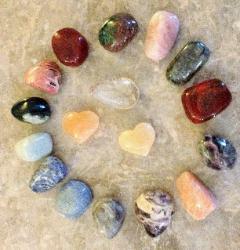 Crystals are Reiki attuned to allow for the highest energy of the crystal to be used on a mind, body and spirit level. The use of crystals allows for your energy and aura to be cleared, aligned and centered. The stones are cleared and cleansed between sessions.